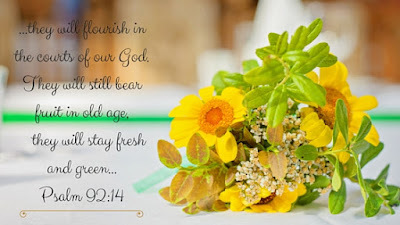 I sat listening to our pastor’s message recently, and as he spoke on worship, three little words dropped into my heart…keep us fresh! The picture of withered flowers came to mind, and I wrote a quick note to return to later. As that picture and those words lingered, I started to think more about them. Dried flowers are brittle. They lose the vibrancy of their color and their fragrance slowly evaporates. Sure, we may dry out a meaningful bouquet to frame or put in a shadowbox as a great memory, but they aren’t what were given to us—and they certainly aren’t what we purchase to brighten someone’s day. Memories are meant to be a part of our story as we keep moving forward, but they will never impact another's life the way they impacted our own. To do that we need fresh, alive, vibrant...bursting with color and fragrance moments that reach others. We have to be willing to stay fresh. We need to be in God’s Word, in his very presence, seeking HOW he wants us to reach others, and then be willing to step out in new ways. We’ll never compromise the Message, but the delivery can change! That may mean the music is louder or the lights are brighter. It might mean some torn jeans in church, Bibles on screens instead of paper-thin pages, or sayings we don't quite understand. Maybe even some of the traditional events we've loved in the past are tweaked to open the door for a new way to reach the lost and hurting. And that's okay. Yes, change is hard, but please don’t become dry, brittle flowers clinging to the moments of the past! Be fresh! It might stretch you—but it also just might impact a generation. Paul would love this. Didn't he say he'd be whatever somebody needed in order to reach them with the message of Jesus' love?